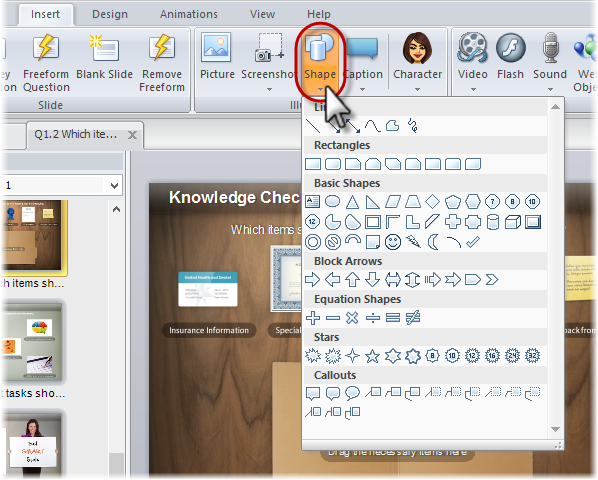 In Slide View, go to the Insert tab, click Shapes, and select the shape you want. Click and drag on your slide canvas to add the shape to your slide. If the shape will include text, you can immediately begin typing—there's no need to insert a separate text box over the shape. To change the look of a shape, select it and use the tools on the Format tab. Or, right-click the shape and choose Format Shape or Size and Position. Tip: If you change the formatting for a shape and want that same formatting to be used for all future shapes you add to the current quiz, right-click the shape and choose Set as Default Shape.